Question: Why have I made £1000s worth of NLP training programs available for just £6.99 per month? Answer: Because I want you to know, learn and experience what I have. My name is David Shephard. In 1990 I discovered NLP thanks to Tony Robbins’ book Unlimited Power. It changed my whole way of thinking about myself, my career, my relationships, my health, money, EVERYTHING! I was sold on NLP. In 1993 I had my first true experience of the power of NLP. In a matter of days, I got rid of my dyslexia, my phobia of bees and wasps, removed my anger, sadness, fear, hurt and guilt from my past AND got rid of a huge limiting belief that I wasn’t good enough. In that moment I realised that my life purpose was to enable as many people as possible to learn and experience the same things I had. In 1994 I started teaching and certifying people around the world in NLP. To increase the number of people I could reach I started producing audio and video programs so that people could learn from wherever they were in the world but for many they were too expensive. Thanks to technology I can now make high quality NLP training, easily and flexibly available for a very fair price. I wanted to make it all available for the price of a few coffees per month. People told me I was mad but I did it anyway. So here is the Netflix of NLP and Personal Development! Why would you want to subscribe to my NLP and Personal Development App? You are curious about what NLP can do for you and you want to put a toe in the water to find out more at minimum cost or risk. You already know you want to learn NLP and because of your personal circumstances you can’t attend a live training. You want to learn NLP without the cost of a live training, hotels and travel. You want to learn NLP and want to check me out before you commit to do a live training with me. You are already trained in NLP and want world class NLP training resources to review, deepen and further your learning wherever you are or go in the world. You love the convenience of being able to learn NLP wherever you have your smart phone or tablet with you. You want conveniently accessible world class NLP and Personal Development content whenever you want, wherever you are. I’ve got my why and want to sign up now! In this CD David introduced you to the core concept of NLP and gives you some simple techniques to dramatically improve your communication skills. 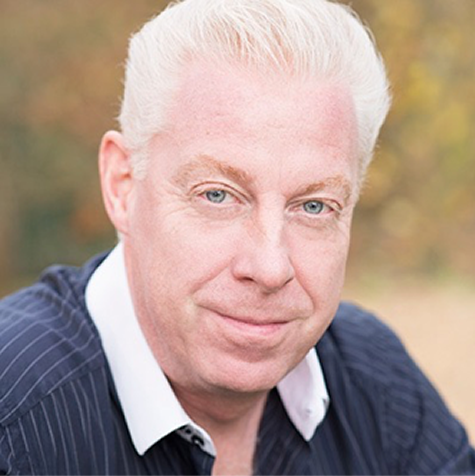 Using NLP, neuroscience and self-hypnosis David teaches you how to become deeply relaxed in minutes. This is also great for insomnia. In this short programme David teaches you how to create powerful rituals to use daily, energise yourself and enter deep meditation. In this programme David guides you to discover your life purpose, install powerful learning strategies and eliminate limiting mind sets and beliefs. Imagine being able to create your future with the same certainty you have for the past. Mohammed Ali believed in a future history. Here David will guide you through the process to create yours. Just suppose you were able to attract money and wealth as if you were a huge magnet. This process shows you how. Napoleon Hill kept the true process of the mastermind, secret. Here David reveals the technique and guides you through creating a mastermind group beyond your wildest dreams. Imagine bringing the concepts of The Matrix movies and quantum physics to life and beginning to apply them in your life. This is possibly one of David's most mind blowing programmes. Filmed in front of an audience of 400 people. This is the programme David runs annually to ensure we always make the year to come the best ever. 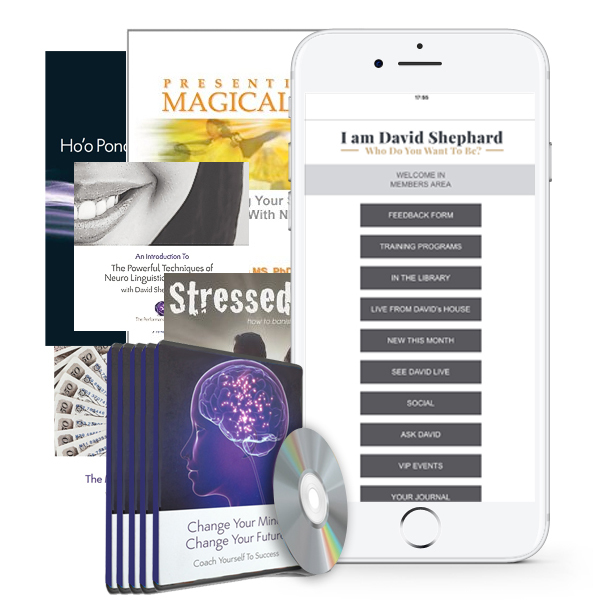 In this 6 CD collection David shows you how to use powerful NLP techniques like anchoring, sub modalities, beliefs and values to change your life in any way you desire. This 3 CD set was recorded at David's highly acclaimed Money Programme. What's the difference that makes the difference with regard to building personal wealth? Here you'll discover the mindset, the beliefs and the strategies of the naturally wealthy. Attend an entire 3-day training programme in audio and video. You'll learn how to become one of world’s most inspiring and captivating speakers. 4 DVDs and 6 CDs. In this single CD David will explain some of the world’s most guarded spiritual and magical teachings. You'll learn how to increase your life force, enter the revered state of the Kahuna and how to truly meditate. This beautiful and powerful process comes from Hawaiian Huna . Doing it will enable you to resolve conflict in your life, create deep personal healing and let go of what you no longer want. Attend a full NLP Practitioner training in audio and video where ever you are. A total of 14 CDs, a DVD and full manual! In this unique 8 CD programme with live demos on DVD David teaches everything you can do with your language to sky rocket your influence and abilities to create massive change through nothing other than your conversation. Probably the most complete covert hypnosis and NLP training available today. This is an important part of David's NLP Master Practitioner training. This programme covers the core of NLP Master Practitioner material. Learn about beliefs, values and meta programmes. This is some of the most powerful NLP techniques for application in business. This is advanced NLP and covers many things not covered on most NLP Master Practitioner Certifications. NLP has some of the most powerful coaching techniques available. In this programme David teaches you how to apply them to a structured coaching process. Finally, he'll teach you how to sell it! Have you ever wanted to become one of the world's best natural sales people? Attend this 2 days programme on audio and video and David will show you how. This is a 6 CD and 1 DVD programme. All the techniques are demoed live on video so you can see how to do it and replicate the results yourself. Latest training programmes. David’s latest training Masters Of Influence is being released monthly. Sessions In The Library. David analyses a book from an NLP perspective so that you can get the results without reading the book! Robert Greens’ Laws Of Power is already in there. 48 videos. A Date With Excellence – David does a live NLP modeling interview with world class models of excellence. Steve McDermott, 3 times winner of the motivational speaker of the year, is already in there for you to model excellence. Plus! All of David’s Facebook Lives categorized by subject so that you can find what you want fast. You get full access to everything for the first month. If you cancel before the end of the month you pay nothing! After that you have a choice. AND as long as you keep your subscription up to date this is the price you will pay for the lifetime of your subscription. Click subscribe and enter your payment details, you won’t be charged anything for a month, cancel before then and you pay nothing. You’ll receive an email from me giving you full instructions on how to download the app and your passcode to get access. What will happen if you don’t subscribe to my app? Nothing! Other than you won’t have access to world class NLP content for a very fair price wherever you are. What will happen when you do subscribe to my app? You’ll have 100s of hours of world class NLP content available to you immediately. Literally every NLP product I have ever produced in your pocket or bag. Plus the very latest developments I release all the time ,right there in the App. AND a Facebook Group that only subscribers get access to if you want to ask me questions and get personal answers from me. I deliberately made it a no brainer for you to subscribe AND I know you’ll love it! "I've been a professional international motivational speaker for over 23 years. On this app you'll discover just about all I know about personal development and success. Delivered in such a way that even a lad from Yorkshire, England (me) can understand and instantly use"
The I am David Shephard app is the best app I've ever downloaded. David Shephard has the gift of turning complex subjects into a pleasurable and joyful experience. The app is so versatile that you can create your own playlist of your favourite subjects. Mine is the Daily Power Rituals. I listen to it every morning and before I go to bed. The language is so well crafted that it is "as second nature to me now, like breathing out and breathing in..." I highly recommend daily dosages of I am David Shephard. If you want to be more successful in life you need to learn how to run yourself. NLP gives you all the methods and information you need. 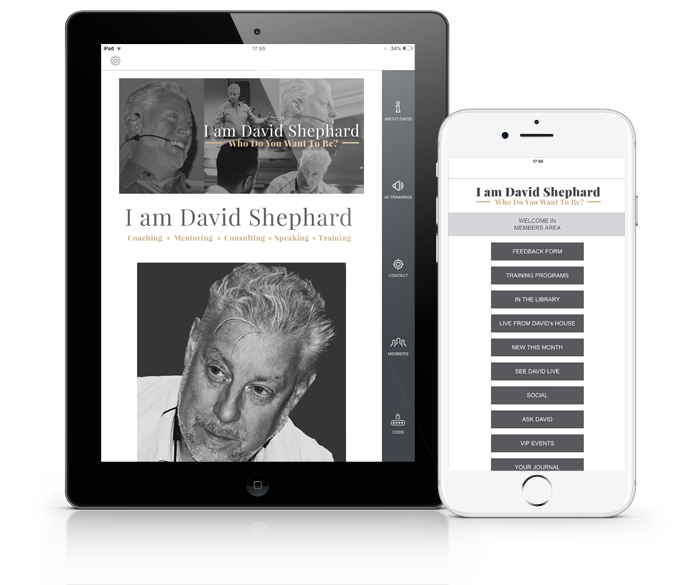 The I am David Shephard app is the ultimate medium to consume a great amount of NLP whenever and wherever you are at very low price. The concept and presentation of this app “I am David Shephard” is truly in line with David’s passion for innovation, superb delivery, giving excellent service and added value! Easy to navigate with seamless videos and sound files, David’s total NLP training materials are available to a worldwide audience who can see for themselves the magic of NLP. For myself, who has completed numerous trainings with David and other leading NLP trainers over 29 years it is a delight to be able to refresh my learnings and assimilate new material, some of which I can download and review at leisure. In one word, Inspirational! NLP Trainer and Accredited Master Coach (AMC). Master Hypnotherapist, Master TimeLine Therapist. Fellow CMI, Chartered MCIPD, MIIC&M, MANLP, NRAH, MCThA. What's more you can take notes, track goals, chat with other like minded free thinking individuals from all over the world and connect with me to ask your personal questions via the exclusive, private Facebook Group. 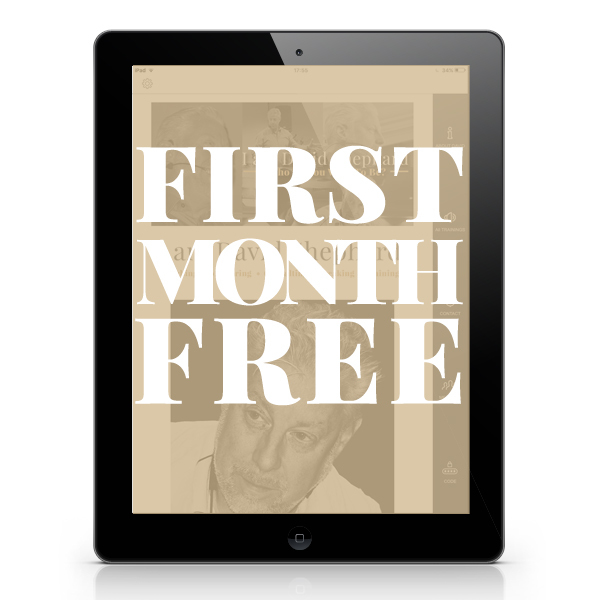 Get the first month for free! cancel your subscription within a month. will be charge £6.99 each month until canceled.